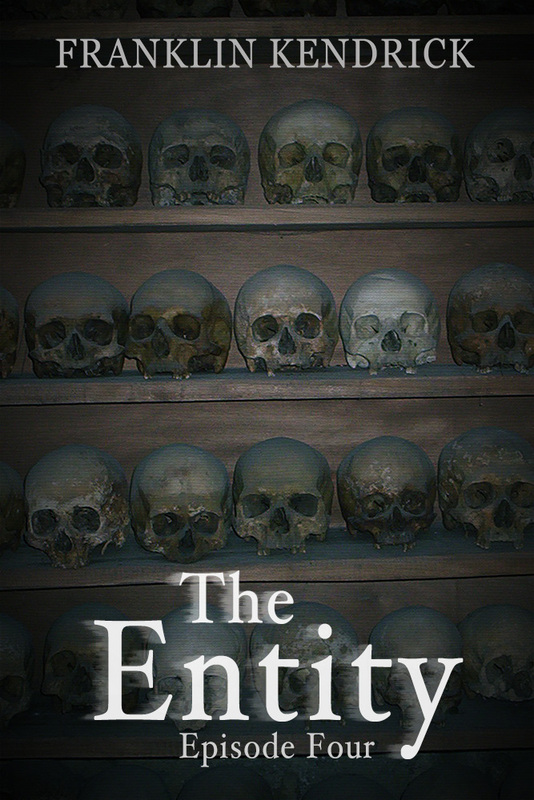 After a small delay in solid writing time, I have finally published Episode Four of The Entity. Though a bit shorter than Episode Three, this episode answers many questions about the house’s history as well as sets the finale in motion. I hope it doesn’t disappoint. Just in time for halloween, here is the cover as well as an excerpt of the book that you won’t find anywhere else. Enjoy! She started in the attic and made sure to give every corner of every room a good sweep with the fragrant sage. In no time at all she was back on the first floor. The rooms that she was most concerned with were the secret study and the guest bedroom. However, the study gave her no problems at all. She expected something to happen – some pen to roll off the desk or something to get her attention – to protest the sage. But, nothing did. So she moved onto the last room – the guest bedroom. The hair on her arms prickled as she stepped over the threshold. She walked completely into the room and started her long sweep of the corners, prepared to walk right back out. But, as she went for the door, an unexpected and terrifying thing happened. The door slammed shut on its own! Clarissa dropped the sage on the floor, which had already burned down to nothing, and grabbed the doorknob with both hands. She tugged at it with all her might, but the door wouldn’t budge. “No!” she cried and saw flashbacks to being locked in the study. She had to get out, but she had to stay calm. Then she heard noises. A set of very heavy footsteps ran from the other side of the door, further into the house. Who was it? For anyone interested in checking it out, you can get it at these links: US and UK. Also, for those who like to know how long a book is before they buy, I have added approximate word counts to my episode descriptions on Amazon (sometimes rounded up ten or so words, sometimes down ten or so) so that you know how long each episode is. They will eventually be offered as a full bundle and paperback edition, but that is down the road with still two more episodes to be finished. I am planning on using NaNoWriMo to finish up the finale of the series, aiming for another 30,000 or more words between the two. What does Clarissa find out about the house’s history, and its ghosts? You’ll have to read on to find out!